The two worlds combine this week in the pages of "Archie Comics" No. 641, a story drawn by artist Dan Parent that extends through issue 644. Show creator Ryan Murphy said the story honors and celebrates "the two worlds." Blaine Anderson and Kevin Keller? Betty Cooper and Noah Puckerman? Things are not as they usually are in the halls of William McKinley and Riverdale high schools. 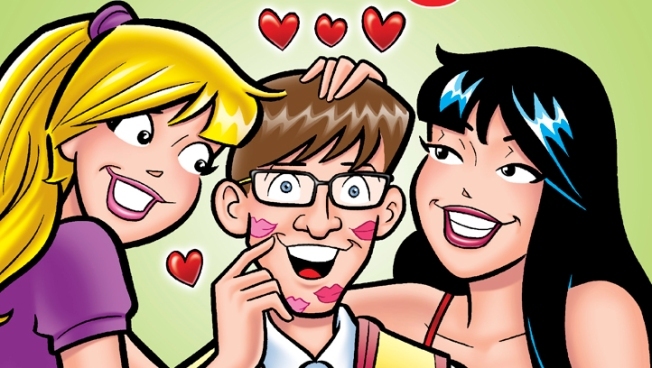 And that's just the way it should be, said Roberto Aguirre-Sacasa, who writes for "Glee" and penned the four-issue story arc, "Archie Meets Glee," that sees Riverdale and McKinley's famous — an vocally talented — students come together in a crossover crash that blends the snark of the television show and the long-standing wholesomeness of Archie, Jughead and Betty, among others. Show creator Ryan Murphy said the story honors and celebrates "the two worlds. Not just their similarities, but their differences, which I've think we've done." So what prompted it? A friendship between Aguirre-Sacasa and Archie Comics co-CEO Jon Goldwater, who met New York Comic Con in 2011. "The Archie brand is very versatile and we're continuing to explore our limits every day," Goldwater said of the latest crossover. "How perfectly these worlds mesh and how funny the comparisons are between the characters," said Aguirre-Sacasa, who was given free rein to tell the story that uses the conventions of wormholes and time warps to place the characters in the different universes. "The idea was that rather than just have them meet at a competition to do something that was a little bit more comic bookish," he said, adding that he's long been a lover of comic books, science fiction and alternate realities. The kids from both sides will have to figure out how to get home but, in the meantime, why not have some fun. "Once you got that big story up and running you could tell a lot more little stories. Veronica, for example, sets her eyes on Finn immediately, but Veronica Lodge's social status is ... at the bottom of the food chain," Aguirre-Sacasa said, adding that ultimately she and Kurt become best friends. "And back in Riverdale, when Josie and Pussycats realize that Mercedes Jones has the greatest voice ever, they set out to recruit her for the band," he said. Kevin Keller, Archie's first openly gay character, meets Blaine, who's been "zapped in Riverdale and Kevin is immediately intrigued by this new bow-tie wearing student," he said. Then of course, there's Sue Sylvester, the fast-talking sardonic queen of mean. She'll square off against Jughead, Aguirre-Sacasa said.